I survived, they did not manage to tie me up, and we had an awesome first week of school. This is an exciting year for my family because...look at my big first grader! My oldest is in first grade and so that means I get to see her even more during the day. No, she is not in my class. (That would be REALLY bad.) But, she has the best teacher and she is loving school and she is right next door, YAY! This week flew by, we were crazy busy trying to squeeze in as many rules and procedures as possible. I always forget how young they are at the beginning of the year. On Monday at about 9:15 (45 minutes into the day) I had a kiddo ask me if it was almost time to go home. Oh honey, its going to be a LONG day! HA! Here is a little look at our week, I tried to make sure I took lots of pictures so I could share with you. Monday we began our Back to School book. I LOVE this book and students/parents do too! The first page is "Meet My Teacher" where the students draw a picture of their new teacher and write something they have learned about him/her. I created a little Around the Room activity to help. Great first day activity since they are so WIGGLY! On Tuesday we began Readers Workshop. We read for a whole 5 minutes, WOO HOO! We are going to build up our reading stamina slowly. 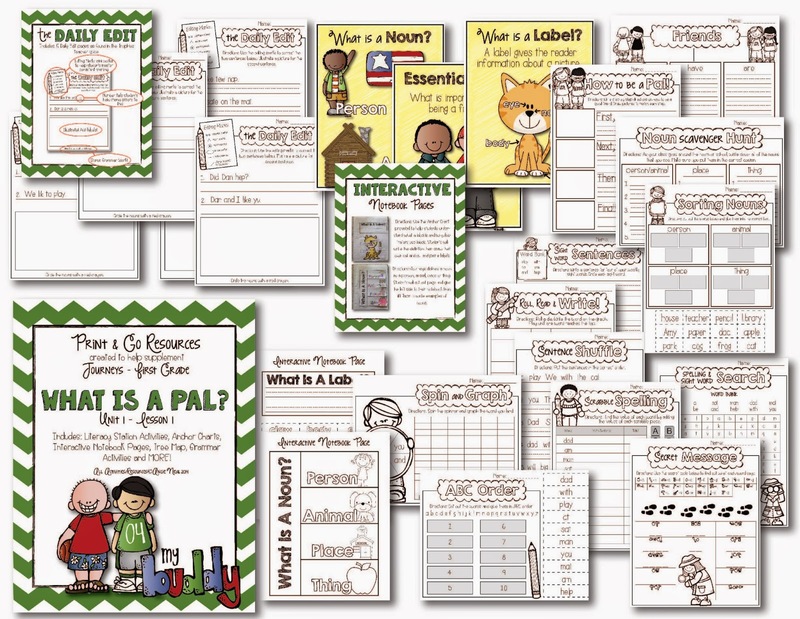 My book boxes are from Really Great Stuff, my teaching neighbor showed me these awesome clear labeling pockets from Lakeshore and I created this editable PDF for the labels. These labels are FREE for Facebook Fans. Simply like my page to download them, click on the tab on the right to get there. My week started to get a little blurry on Wednesday, it was 113 degrees so that means no outdoor activity. No outdoor activity = rainy day schedule = NOOOO!!!!!!! We made the best of it and started working on our No, David art. Thursday, oh Thursday. My little one had enough by Thursday, we slept in over the summer and she is having a hard time changing her sleeping schedule. Thursday was another hot one at 114 degrees so again, no outdoor activity. Oh my! We finished out Back to School book on Thursday and sent it home. Friday was crazy hot again but I can put up with just about anything because IT IS FRIDAY! We brainstormed the classroom rules and did the writing to accompany our David art. They turned out so cute! This is by far one of my favorite bulletin boards of the year. 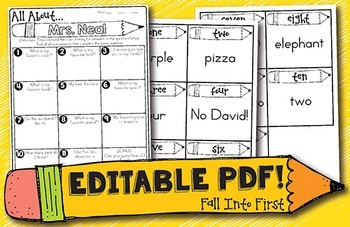 The David art and Writing page is a free download in my TpT store. Several people have asked about the poster, I am trying to clear this with David Shannon because I don't want to violate copyright. If/When I hear back with permission I will make it available. Next week we get to begin our NEW Journeys Reading Series and we are starting with the story "What is a Pal?" I am super excited about this new series. I have created a ton of stuff to use next week. 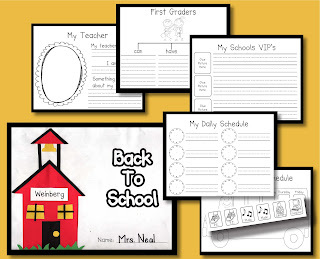 We are going to begin our Interactive Notebooks and Literacy Stations. I am looking forward to sharing more with you! Now I am off to bed and I am looking forward to enjoying my Sunday with my family. Sounds like you had a fantastic first week...minus the heat advisory days! 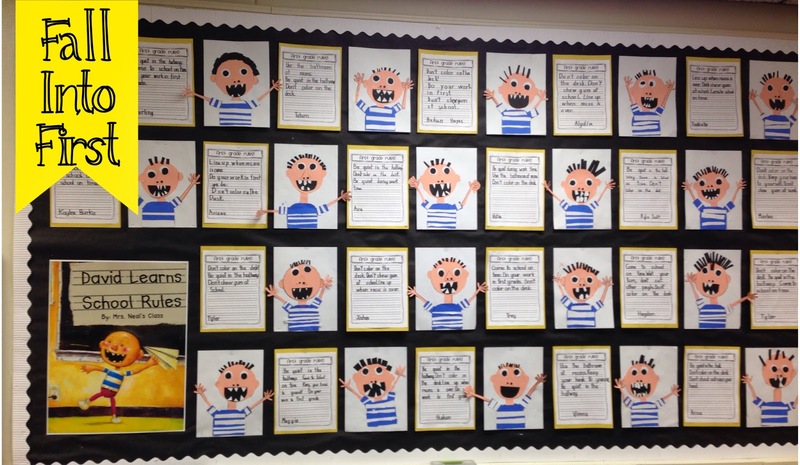 Your bulletin boards and David activities are just the cutest! Wait... first week of school in July?? Is it year-round school?